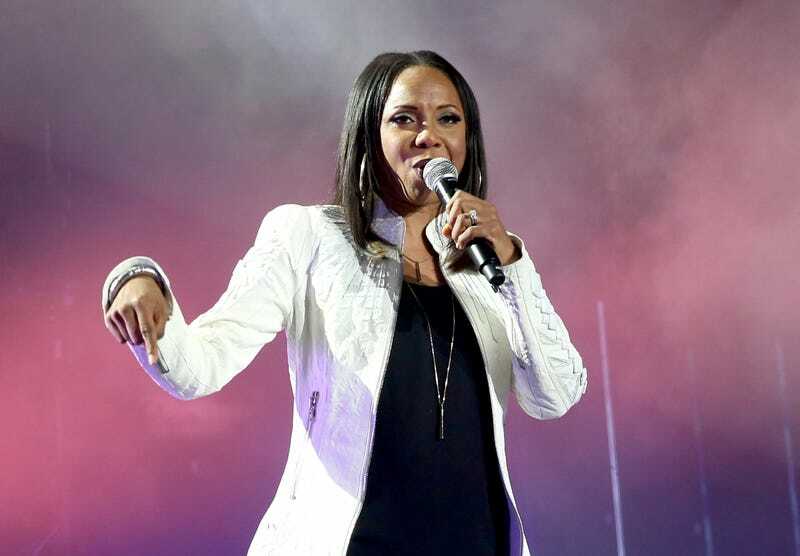 MC Lyte recently performed with a nostalgic lineup at the Cincinnati Music Festival, proving once again that black don’t crack. Lyte (born Lana Michelle Moorer) looks and sounds like what happens when you mind your business and drink water. CMF’s sponsor, P&G, has championed black women, namely through My Black is Beautiful, an initiative to spark dialogue around black beauty. They tapped MC Lyte to give a keynote speech during CMF and she gushed over the opportunity. I got a chance to chat with MC Lyte about the festival, women in hip-hop and more. The Root: How do you explain the longevity of hip-hop? MC Lyte: It’s not unlike P&G. It’s being real with what it is that you’re promoting, being authentic and then it’s also being able to really connect with people and I think the era that I hail from, we were not very different from our audience, although you know we did a lot of you braggadocious type stuff. I think the audience felt like we were cool, from the block and you could talk to us. And they could listen to the music and feel like they were part of it and not separate from it, so I think that’s what kept us winning. TR: How do you feel about your contribution to hip-hop? MCL: I can only thank God that I was there at the time that I was. Coming into the game right now, I don’t know, I’m quite sure that I would not fit in. I think that I would have a message that’s very much like I had when I first got into the game and I don’t know that that’s so popular now. I was on an anti-drug crusade and now when I listen to today’s hip-hop, it’s like, “pop a molly, smoke a something;” it’s the promotion of drugs. So for me, a song like “Poor Georgie” that tells of the demise of a young man who succumbed to all of these outside pressures of taking drugs, drinking, drinking and driving and all those things, I think my message would be a little different from what’s happening today. So I’m just thankful that I got a chance to break ground many years ago. TR: How did you deal with racial bias in your career? MCL: Because I am a woman of color, every community is like my own. It doesn’t really have to be my business where I experience racial biases. If my sisters experience it, then I experience it. A sister or brother being mistreated harmed [or] discriminated against, it all feels like it’s my world. I toured with Public Enemy, so you could imagine what was happening on the outside of these coliseums with these people who were upset that Public Enemy was in the building, saying, “Shut em down” and “Fight the powers that be!” So I’ve had this experience on and off stage. TR: How come men can beef in hip-hop and it’s not an issue, but when women do it, it’s a challenge to sisterhood? MCL: Let’s just take, for instance, Cardi and Nicki. They just had music out at the same time. They released videos at the same time. They had music on the radio at the same time. So I don’t think it’s an issue that [we don’t allow it] to happen. Does the team that is putting out the females believe that they can exist in one arena at the same time? Men do the same thing. When there is a man like Jay-Z about to drop a record, no one wants to drop when he drops. They’d rather wait for another quarter or rush and get it out before he does. They don’t want to meet face to face. I can imagine with another female emcee, you want all the attention. So let me just wait for her to be done and then I’ll release mine.